New York, N.Y., January 23, 2019 – China has significantly expanded its use of ATA Carnets for the temporary, duty-free importation of various types of goods. As of January 9, the country is now accepting the widely used “merchandise passports” for professional equipment and product samples, according to the United States Council for International Business (USCIB), which administers the ATA system in the United States. Previously the country honored ATA Carnets just for goods destined for trade shows and exhibitions. China also extended the period for which goods may be brought into the country under ATA Carnets to a full year, from six months as had previously been the case. ATA Carnets are internationally recognized customs documents that allow for the temporary importation of various types of goods, duty-free and tax-free, generally for up to one year. They are used by a wide variety of exporters and businesses as a simple, cost-effective means of moving goods temporarily to 78 countries and customs territories around the world. Additional information on developments related to the use of ATA Carnets in China is available on USCIB’s website here. The worldwide ATA Carnet system is overseen by the World Customs Organization and the International Chamber of Commerce (ICC), for which USCIB serves as the American national committee. Find out more about the services offered by USCIB to facilitate cross-border trade and investment at www.uscib.org. The United States Council for International Business (USCIB) promotes open markets, competitiveness and innovation, sustainable development and corporate responsibility, supported by international engagement and regulatory coherence. 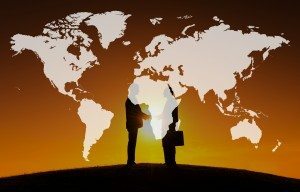 Its members include U.S.-based global companies and professional services firms from every sector of our economy, with operations in every region of the world, generating $5 trillion in annual revenues and employing over 11 million people worldwide. As the U.S. affiliate of several leading international business organizations, including ICC, USCIB provides business views to policy makers and regulatory authorities worldwide. USCIB also works to facilitate international trade and investment. It is the U.S. national guaranteeing association for ATA Carnets, which enable the temporary export of many types of goods, free of import duties or taxes, for up to one year. USCIB members, friends and staff are mourning the loss of Bruce Wilson, an innovator in international trade, logistics and insurance who headed USCIB’s ATA Carnet department for more than a decade. Wilson passed away on October 17 at age 87. ATA Carnets are international customs documents than enable the temporary, duty-free importation of numerous types of products – including goods for trade shows and product demonstrations, as well as professional equipment – to scores of countries and customs territories for up to one year. 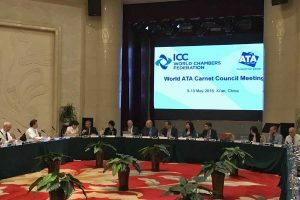 The worldwide ATA Carnet system is overseen by the International Chamber of Commerce (ICC) and the World Customs Organization (WCO). Joining USCIB as director of Carnet operations in 1987, Wilson helped to significantly expand and strengthen the organization’s role as the U.S. national guaranteeing association in the worldwide ATA Carnet system. The company he founded, Corporation for International Business, serves as one of two recognized USCIB service providers for ATA Carnets (the other is Roanoke Insurance Group, Inc.). Wilson traveled extensively, representing USCIB at ICC and WCO gatherings, developing a deep understanding of both North American and international surety markets. One of his many accomplishments at USCIB was the development and implementation of a bilateral agreement between the United States and Taiwan, Province of China that mirrors the ATA Carnet system, thereby opening Taiwan to additional U.S trade and trade promotion. Wilson is survived by his wife Kathleen; a son Curt; daughters Leslie August and Moira; his former wife, Kathryn M. Hamann; and grandsons Nikolai, Henry, Chuck and Harrison. Memorial services will be held on November 10 at Davenport Family Funeral Home and Crematory, 149 West Main Street in Barrington, IL. In lieu of flowers, the family has asked that donations be made in Wilson’s name to The Salvation Army, Chicago Metropolitan Division or to Save the Children. Earlier this month, Qatar officially joined the ATA Carnet system, which enables the temporary duty-free, tax-free importation of various types of goods in over 80 countries and customs territories around the world. 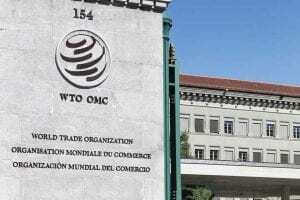 The Carnet system is overseen by the International Chamber of Commerce and the World Customs Organization. USCIB serves as the U.S. national guaranteeing association for the system. During her address to the WATAC meeting, which was attended by USCIB President and CEO Peter M. Robinson, Al Thani noted that Qatar’s formal accession to the Carnet system came as a result of lengthy negotiations conducted during the previous sessions with WATAC leadership and council members. She said the ATA Carnet plays an important role towards advancing the cause of free trade as a mechanism of trade facilitation. Al Thani further noted that world trade is facing momentous challenges nowadays, with protectionist policies on the rise again and the State of Qatar’s accession to the Council is a testimony to its adherence to free trade, and to its belief in the importance of the free movement of goods and services around the world. The ATA Carnet is the global gold standard for temporary admissions under the auspices of the World Customs Organization. ATA Carnets are international tools of trade facilitation, which serve as a temporary export-import documentation. The ATA System is in place in over 85 countries and territories, and provides duty-free and tax-free imports on goods that will be re-exported within 12 months. Please visit the Qatar ATA Carnet page for more info. USCIB is a longtime partner in the annual World Trade Week festivities in New York City. World Trade Week, a celebration of international commerce in cities across the United States, was launched by President Franklin Delano Roosevelt and brings together trade champions and companies of all sizes to mark the critical importance of cross-border commerce in promoting American competitiveness and global leadership. 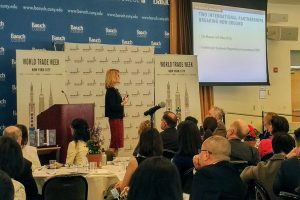 World Trade Week NYC 2018 – despite the name, actually a full month of events and activities – kicked off this week with a high-level awards breakfast hosted by the Weissman Center for International Business at Baruch College, part of the City University of New York. Among the award honorees was the New York Genome Center, whose president and COO Cheryl Moore also served as the breakfast keynote speaker, providing an overview of New York’s efforts to foster growth in the life sciences industries. Other businesses recognized for export success included Magnetic Analysis Corp., Innodata, Inc. and Classic Rug Collection, Inc. 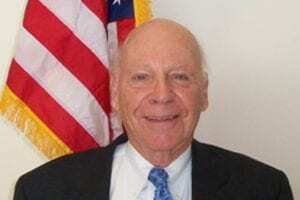 Empire State Development’s Global NY initiative was also honored, as was Irving A. Williamson, a member of the U.S. International Trade Commission, who was presented with a lifetime achievement award. USCIB Vice President Jonathan Huneke served on the steering committee for World Trade Week NYC 2018. For a full list of World Trade Week events in and around New York City, click here. New York, N.Y., January 31, 2018 – India has expanded its use of ATA Carnets for the temporary, duty-free importation of various types of goods. 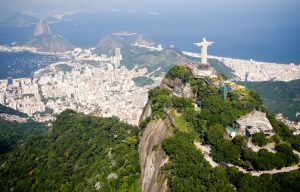 As of January 18, the country is now accepting the widely used “merchandise passports” for professional equipment, according to the United States Council for International Business (USCIB), which administers the ATA system in the United States. ATA Carnets are internationally recognized customs documents that allow for the temporary importation of various types of goods, duty-free and tax-free, generally for up to one year. India previously accepted Carnets only for goods destined to fairs and exhibitions, for a maximum period of six months. It is now also honoring them for temporary importation of professional equipment for up to two months, with the opportunity to renew for an additional two months. 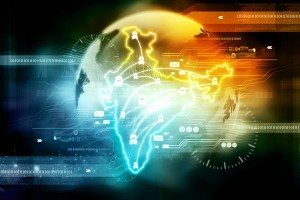 Additional information on developments in India is available on USCIB’s website at https://www.uscib.org/india-ud-1614/. 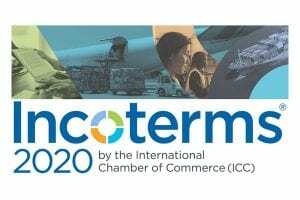 The tenth installment of the International Chamber of Commerce’s (ICC) World Chambers Congress (WCC) concluded last week in Sydney, Australia, which brought together over 1,200 delegates from across the globe to discuss challenges impacting the business and chamber communities and to exchange knowledge and expertise while promoting result-oriented innovation. In an ever-changing business climate, the Congress addresses and examines today’s most significant global issues. 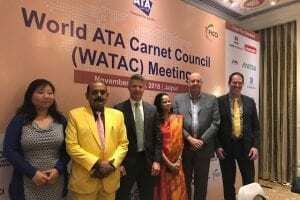 USCIB’s Senior Vice President for ATA Carnet and Trade Services Andy Shiles attended the ATA Carnet global management meetings held during the WCC. A major outcome of these meetings was China’s announcement of an expansion of goods under their Carnet to include professional equipment and commercial samples. While China has yet to announce when they will implement this expansion, Shiles believes this will have a positive impact on U.S. trade. Shiles also reported that commitment for the development of joint projects to benefit the ATA Carnet have been outstanding, with excellent progress being made with Australia, Brazil, India, Indonesia and Poland. Additionally, the meetings deliberated on the e-carnet development project, which is on track to begin a pilot in the latter half of 2018. If any U.S. companies have interest in getting exposure to their goods in the Chinese market, kindly contact Andrew Shiles.